Oh, all right, I’ll admit my dirty little secret. I watch the Housewives of Everywhere. And I was on board when single New York non-housewife, Bethenny Frankel, distanced herself from the women of the Big Apple and went solo to eventually snag her own Bravo gig. Recently, the acerbic entrepreneur landed under Ellen DeGeneres’ wing and now stars on her own daytime talk show. And when she introduced the Skinnygirl margarita, I gave it a go. And, for what it was, it was pretty good. But I don’t drink enough margaritas to warrant going the Skinnygirl route, but it’s a good idea nonetheless for those who don’t want a sugar-laden 500-calorie margarita. Makes sense to me. While Frankel sold the Skinnygirl brand to Beam, she’s still the mug promoting the goods. And now Skinnygirl has taken advantage of a profitable niche market and currently touts flavored vodkas, myriad ready-to-serve cocktails and wine. Remember, I’m here to take the bullet when it comes to testing new products, and with that in mind, I put a trio of Skinnygirl spirits to the test. My results follow. Skinnygirl California Red Wine, The Wine Collection, about $15 for 750ml at most liquor stores. First look: The label on the screw-cap bottle features that cute skinny mini logo of a skinny girl holding a bottle in one hand and a glass in the other. The back label touts the red as a “warm medium-bodied blend.” The aroma should bring to mind blueberries, hibiscus and a “hint of caramel.” The wine offers 100 calories per each 5-ounce serving. It contains 12-percent alcohol by volume. Vinted and bottled in Graton and American Canyon, California. Good news: Love that label. Bad news: Marketing wine specifically to women reminds me of being a child forced to sit at the kid table during holiday dinners. I never like being set apart. I’m a grown-up and I can drink the same wine the big boys drink, thank you very much. And that 100-calorie serving saves you about 25 calories when you consider that the average wine nets you 125 calories per 5-ounce glass. I wouldn’t mind so much if the wine was good, but it’s not. The flavor is thin and the price far too high. Last words: Skinnygirl falls flat with this wine. Skinnygirl Pina Colada, $14 for 750ml at most liquor stores. First look: The label on the skinny frosted bottle brags that this pina colada is guilt free and therefore can go beyond vacations, the time when we most often indulge in this delicious high-calorie cocktail. This rum-based drink contains 33.3 calories per 1.5-ounce servings. It serves up 9.95-percent alcohol by volume. Good news: This ended up being the favorite of the three Skinnygirl drinks tested. But, of course, you can’t expect a traditional pina colada, which tastes like coconut-and-pineapple ice cream with a rum kick. And keeping in mind that this isn’t a blended drink, it still offers up a nice, not overly sweet, coconut cocktail that suggests a pina colada. And while I don’t want it for my everyday drink, should I decide to imbibe daily, I would go for a Skinnygirl pina colada when I’m craving the tropical cocktail sans the fat and calories. Bad news: I thought it had a slightly bitter finish. Make sure you serve it ice cold. Not a great tepid drink. Last words: Yes, I like pina coladas, and make mine a Skinnygirl. 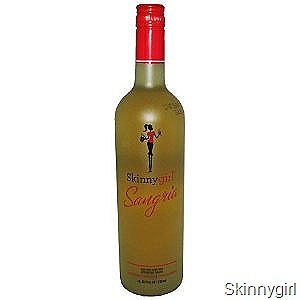 Skinnygirl Sangria, about $14 for 750ml at most liquor stores. First look: This is a white sangria made with grape wine and natural flavors, according to the label. It contains 132 calories per each 5-ounce serving and 10.5-percent alcohol by volume. Good news: Seriously, there’s simply nothing good that I can say about this white sangria. Bad news:The bottom line is that it tastes like inexpensive, overly sweet white wine. And, need I say anything about that color? Last words: When I think of sangria, I think of a fruity, fun red. This looks like it belongs in a specimen bottle. Drat. I couldn’t resist saying something about the color after all. OK…so no need to try those. Good job, Sabine! Thanks, Laura. Nope, I took the bullets. You’re safe for now.